Shortly after I checked in my review, The New York Times Book Review ran theirs, a great piece by Jennifer B. McDonald. After doing some fact checking of her own, Ms. McDonald learned that “Lifespan…” is not the product of a “seven year” argument as its reverse cover claims. I have to admit that I was wondering about the authenticity of “Lifespan…” too, because, at one point, Fingal starts making jokes that seem intended for a wider audience of some sort. Still, I enjoyed the book, and would love to have had it when I was still teaching. As Ms. McDonald pointed out in the NYTBR Podcast, it’ll likely become required reading at j-schools. 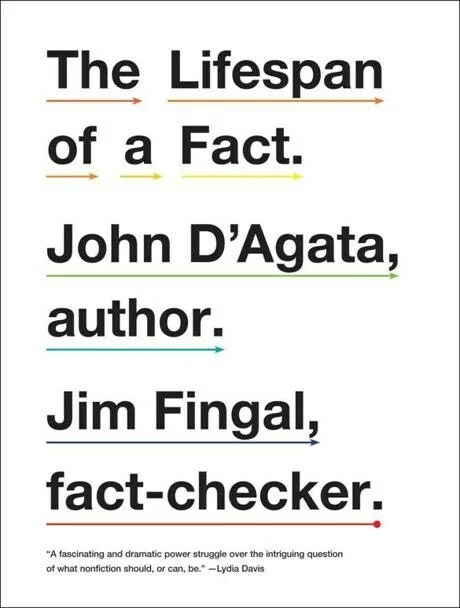 UPDATE: We hear from the man himself, John D’Agata, in this piece from NPR’s Morning Edition.